This invaluable tip that Gene Wallock told me about a long time ago can be seen on the work table as shown below. Always put the silk down on top of multiple layers of newspaper to cut on. 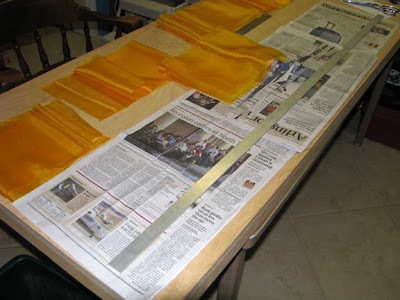 The razor blade slides along smoothly cutting the silk along with several layers of the newspaper underneath. The silk never tries to pull or bunch up like it does if you try to cut the silk directly on the wooden work table.